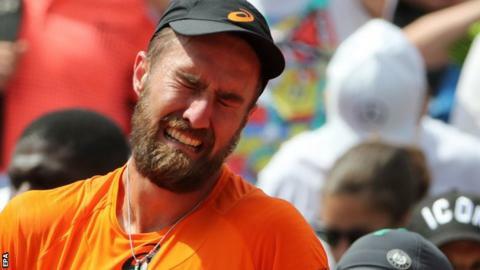 A tearful Steve Johnson said the recent death of his father left him an "emotional mess" as he won a dramatic match against Borna Coric at the French Open. The American, 27, sank to his knees and cried on court after the four-set second-round win at Roland Garros. Steve Johnson Sr, a tennis coach who introduced his son to the sport, died at the age of 58 earlier this month. "I just miss my dad," the world number 26 told Tennis Channel. "I wish he was following along - I know he is from upstairs - but it's just so emotional, it's hard to describe. "I just knew he was looking down on me on that last point and gave me the strength to finish it off." Johnson had pulled out of the Italian Open earlier this month when he received the news of his father's death, returning to action in Geneva last week. His mother, sister and fiancée all joined him in Switzerland and his father had been due to travel to Wimbledon next month. Johnson goes on to face Austrian sixth seed Dominic Thiem in the third round in Paris. "Physically I'm OK, emotionally I'm a mess," he added. "I just know this is what he always taught me to be - a fighter, be a competitor, day in day out, so that's what I'm going to do. That's the only thing I can do." In a match that saw tempers fray at both ends, Croatia's Coric repeatedly smashed his racquet into the court after losing the fourth set, having held set points. "That's quite logical, I think," he said. "I was on the court for four hours. And it's not something which should be my excuse, but I got mad. "I think everyone gets mad from time to time. Maybe I didn't show it in the right way but I made a mistake, but that's it." Asked about his grieving opponent's achievement, Coric added: "I think it was super tough definitely. "All the credit to him that he was able to go through this period and also to play this good."